People on lower incomes pay more than average costs for basic goods and services, according to new research published today by Citizens Advice Scotland. 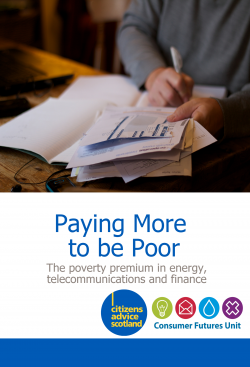 The new CAS report, ‘Paying More to be Poor’ reveals some poorer Scots are paying a poverty premium for their energy, telecoms, credit, loans and insurance. This premium exacerbates the problems experienced by those living at or near the poverty line and can force those on a low income to cut back on essentials like food. This in turn adversely affected their health and relationships. Energy: Low income families are more likely to use more expensive pre-payment meters (PPMs) and 24% of those using PPMs spent over £100 per month on their energy. Only 24% switched their energy supplier in the past three years, with those living in the most deprived areas of the country less likely to do so. Telecoms: Those with mobile phones tend to use more expensive Pay As You Go payment methods. They are also more likely to be without mobile phones, and so are hit hardest by the rise in landline costs. Low income consumers are also less likely to switch phone suppliers. Financial services: 53% said they were not using credit or loans, indicating a possible difficulty in accessing these products. Of those who had used credit or loans, 11% were repaying over £100 per month. There is also evidence that low income consumers take out credit or loans without understanding the full costs involved. Others told us they had no home contents insurance, as they find it unaffordable, leaving their home vulnerable in case of accident or theft. “We and other charities have published evidence in recent years showing that there are too many people in Scotland who are struggling on low incomes. What this new research shows is that many of those peoples’ financial situations are actually being made even worse because the poverty they are in. So if you are poorer in Scotland today you end up paying more for basic services, and so become even poorer. This cannot be right, and needs to be addressed.